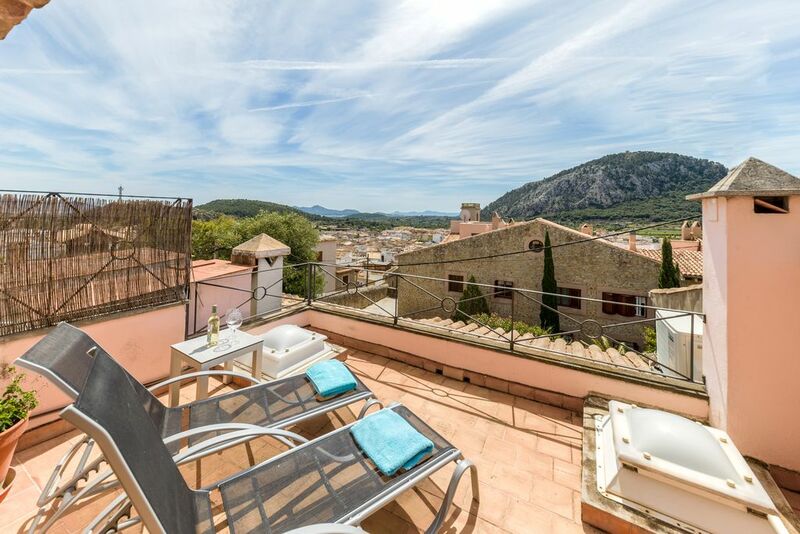 La Caseta is a beautiful, very well kept cozy town house in the center of Pollença, very quiet and central in a side street of the Calvary - landmark of Pollença with 365 stairs - located approximately in the middle. La Caseta has two double bedrooms and a full bathroom with separate shower. A double room is on the first floor, the second in the attic. Particularly noteworthy: the town house offers a beautifully landscaped garden with stone staircase, additional a balcony in the upper bedroom and from there a picture book view over the town. The garden is accessible from the back of the house and equipped with garden chairs, wooden table and barbecue. La Caseta was completely renovated in 2005 and is very bright and friendly furnished in typical rural-Mediterranean style. On the ground floor, from the small lane, you enter the townhouse La Caseta, enter the living and dining room and behind it the kitchen, which leads to the garden in the back of the house. The garden is lovingly laid out with Mediterranean plants and perfect to start the day with a leisurely breakfast or to end the evening with a barbecue and a glass of wine. The property was very clean and sympathetically restored. It had a well equipped kitchen and very effective air conditioning throughout. There was a lovely private garden at the rear and the property was in a quiet location within easy walking distance to the centre of Pollensa. I would advise people hiring a car to hire a small car as the road up to the property is narrow with some hairpin bends and many parked cars. Thanks to Karin who was extremely helpful. We spent two weeks here in the hot summer of 2017, and found it an ideal base. From the garden and its BBQ, to the fully kitted out kitchen, large dining room and roof terrace, this became our happy home after days at the beach or exploring the nearby towns. There was a heatwave during our stay so we appreciated the great air conditioning throughout. Would only add this location is not for those who do not like steps - it is situated at step 200 off Pollenca's approx 400 steps - making for a daily workout if you want to potter down to the bakery etc below. Also, the house itself is split over three levels, so steps throughout. Should mention this house is accessible via a drive along some narrow and steep country lanes in the hills. Fine for the confident driver, but could be a bit daunting if not. Traditional townhouse but with fully modern facilities and beautifully presented. Lovely small garden (not common in old town properties) which is perfect for relaxing in. 200 steps up Calvari but these are shallow and do not present any problem (and you can walk up the hill to the side if you prefer). Beautiful views across the town and to the sea from the top bedroom and terrace. Small supermarket and bakery 5 minutes walk away. Karin & Jaume (from Mallorca My Home) were very friendly and helpful. Das Stadthaus liegt schön zentral, bestens gelegen für Unternehmungen aller Art und kurze Wege zu Restaurants im Ort. Dazu super Service, uns (2 Erwachsene und Kind) hat es gefallen. Wir waren mit dem alten und hervorragend renovierten Haus sehr zufrieden. Auch der Service war toll. The old town of Pollensa is one of the prettiest and most traditional towns in the north of Mallorca. You can enjoy them at any time of the day: having breakfast in one of the coffee houses, shopping in one of the boutiques or jewelry shops. There are a variety of art galleries, museums, and a variety of restaurants to have lunch or dinner there, and perhaps spend the day relaxing on the picturesque marketplace with a glass of wine. The market on Sunday morning fills Pollensa with color and life. The harbor Puerto de Pollensa with its pine-lined beach promenade and the exclusive marina is suitable for strolling. Cala San Vicente is Pollensa's nearest bay. It is the jewel of the Pollensines, beautifully situated in the Tramuntana mountain range, overlooking the colorful Mediterranean and the emblematic mountain that juts out into the sea, the Cavall Bernat, the motif of many respected painters. Seasonal prices from 100 Euro to 160 Euro per night. To determine the exact price for your desired time, please use the practical HomeAway price calculator below or in the right column.